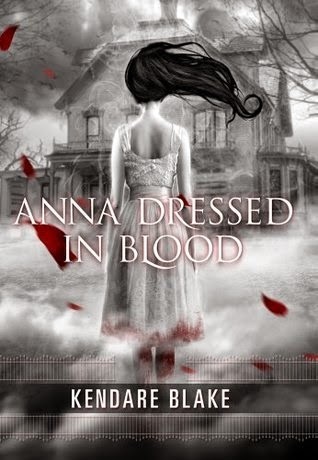 Anna Dressed in Blood is a morbidly good read—for the most part. I usually steer away from books that include ghosts, not because I am easily spooked but because ghosts just don’t appeal to me. Why I took the plunge and read this book, I don’t know. Perhaps it was because I expected some gory things based on the description and title of the book, and I’m a girl who likes gory and morbid things. I like it that this book is written from Cas’s POV. I didn’t have to read a lot of description about how hot a guy is, or how much a character is drooling all over him. I like hot guys, sure, but only when I’m not being reminded of how hot they are every page. Anyway, being inside Cas’s head is entertaining, but it can be annoying, too. The constant I’m-too-good attitude is sometimes very irritating, but let’s face it: everyone thinks like that once in a while. Even fictional ones, apparently. Cas is pretty cool for the most part, but he lacks certain emotions, especially about Anna. Anna could have easily been my favorite character. She was portrayed to be this badass girl who kills everyone who dares to step inside her house. For the first half of the book, she’s that girl, but then. . .nah. She had been tamed too soon for my taste. I understand that it has to be that way, that it’s part of the plot, but I was just starting to enjoy the badassery (I strongly suggest this should be a word) of her character, and it was taken away from me too soon. I do liked her story. It was the highlight of the book for me, because it’s the only thing that spurred my emotions. I like the description of the icky stuff and the way the action was written, but it didn’t give me the creeps that I was expecting (is it because I don’t mind morbid things?). I could have done without the romance, though. The romance between Cas and Anna seems like a sorry attempt of romance to me. I’m a sucker for romance, but this one is just very weird for me. Not because it’s between a living guy and a dead girl, but because it lacks emotions. There are no sparks, no intensity, no out-of-this-world feelings, nothing. Cas sounded robotic when it comes to this part. He’s protective of her, but that’s just about it. He’s a guy, sure, but I believe even guys can think about something sweet and romantic, or Anna should have said something of the like. I’m looking for a. . .deeper emotion between them. I find Carmel and Thomas more romantic, and the crush in there doesn’t even seem mutual, so I think that’s saying something. I hate it that I only liked the morbid things and action that went down in this book, and not the romance. I want a book with a complete package, but this one didn’t do it for me. Still, if you take out the romance part in the equation, I liked this book. I’m going to read the sequel, and I hope there’ll be an improvement in the romance department if it’s going to be a major part of the book (and it looks like it will be).